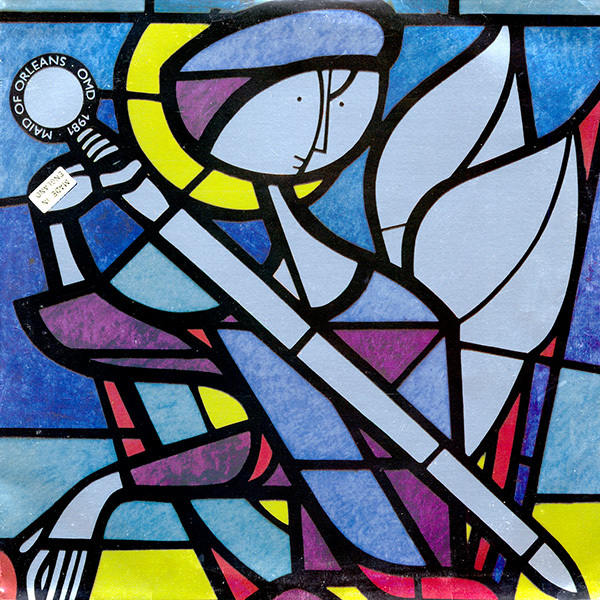 In 1980, OMD were touring “Organization” in Europe and since they were playing places like Rouen and Orleans, wags in their support band named it the “Joan Of Arc” tour. That got McCluskey thinking, so when the tour was over, he read about Joan Of Arc and penned not one, but two different songs on the topic. The first was the second single from “Architecture + Morality” and it also opened up side two of the album, in the hit single placement slot. It peaked at number five in the UK chart and was the second top ten single from the album. This was followed both on the album and in the marketplace by “Joan Of Arc [Maid Of Orleans].” The subtitle was a sop to Virgin who were livid that the band wanted to release a third single from the album with the same title as the second one. Fortunately, for Virgin [and us], the two songs could not be more different. “”Maid of Orleans” opened with abstract block chords of choral tapes from the Mellotron juxtaposed against hard splices of pipe organ patches and a snare roll for good measure. It would presumably get your attention on the radio because nothing else sounded like this. If anything, it reminded me of an orchestra tuning up, but this intro was 35 seconds of a 4:12 song. Daring. Then the rhythm box kicked in and the song’s raison d’être didn’t lag far behind as Malcolm Holmes’ military tattoos punctuated the song’s waltz beat. The drumming was tremendous, and Andy’s vocals were calm and measured as they began singing the song, but each of the four verses happened, McCluskey ramped up his passion to match the fervor of Holms drumming until he ended the song on a climactic peak. As if to underscore the melancholy of the performance, Paul Humphreys was playing his leads on the Mellotron; imparting that curious, richly warm sound that has been likened to a “phalanx of oboes” and with it, the song became capable of breaking your heart. Often is the time that I can listen to this and break down in heavy sobs. It’s such an unusual yet emotional song and a personal favorite OMD song. It’s definitely a powerful cathartic. More than just I thought this. The single made it to #4 in the UK charts and was awarded a silver single. In West Germany it performed whole realms better. It was the top selling single for 1982 in West Germany. It sounded like nothing else in the January 1982 charts it was released as a single in its heyday and 35 years later I’ve heard nothing else like it. The much more abstract title track was next. 3:43 of the band dipping their toes into musique concrete. Subtle bass against organ chords with some machine like throbbing with random and synthetic construction noises placed wildly in the stereo soundfield filled out the empty spaces at the core of this number until the Mellotron choral effects signified the climax of the song, leaving the Mellotron cellos the sonic spotlight for the song’s coda fadeout. Snares in 4/4 with the perkiest electropop melody imaginable heralded the coming of “Georgia.” This almost could have been a single. In the United States, their label Epic, thought it might bear pressing up a promo 12″ of it. In the end this was too fascinating and left-field a track to make a facile single of it. The juxtaposition between the almost cheerfully inane rondo melody that would not quit and the steady beat and the obscure [but still troubling] lyrical content was the sort of thing that makes me stand up and cheer but I could not imagine this song being anything other than a fascinating deep cut, but don’t listen to me. I would have said the same about “Maid Of Orleans!” I especially loved the heavy patina of sound bite found tapes used on this one. A year or two later, and this would have been done on a sampling keyboard. The Soviet sounding male chorus before the last verse were pointers to Georgia. Not the state adjacent to me presumably. The song’s coda was equally unsettling. Synth chords predominated with what could have been equally a found vocal tape or McCluskey himself, mixed way down deep into the track affecting a borderline obnoxious, lilting croon. The synths dropped out leaving only a humming drone until the cold ending by a single drumbeat that sounded more like a gunshot. This album had been quite a journey. It was now time to take it home with the final track. “The Beginning + The End” was a delicate and poised ballad from this band who had opened the album with the nerve-jangling chaos of “New Stone Age.” This song, in contrast, was almost a music box moment, with clockwork timekeeping but surprisingly, a jangling guitar [it even sounded like a 12-string] in the hook seat. a shocking maneuver for this stridently modernistic band. But the vibe of the song is fantastic. It showed the band were able to step outside of the technopop box whenever they wanted to. With this album, OMD definitely hit some sort of sweet spot. It sold over four million copies by 2007 with three million of them in the 1981-1982 window. It took their fame and popularity to its peak which being, once you examine each track, a very idiosyncratic and left-field piece of work with only one obvious pure pop single on it to my ears [“She’s Leaving”]. The rest of it all seems like deep cuts to me, but millions disagreed. OMD really made huge strides on this one with a sonic footprint that encompassed very little of the Kraftwerk technopop of their roots and more than a little prog as clearly evidenced by the heavy Mellotron usage throughout. The appearance of guitars showed that this band had no fear at this stage. As much as they railed against them, they were using whatever they could to achieve the sound in their heads. And that sound was not like anything else out there in the ’81-’82 landscape. While the band had their roots in cold Kraftwerk pastiche, with the exception of “Red Frame/White Light” on their debut, their work had been far more emotional that anything from Kraftwerk since 1979. The group tended to wear their heart on their sleeve, emotionally, while holding their intellectual cards close to their vests. The band were openly emotional about song topics that could be downright impenetrable. To these ears it was a fascinating dynamic. Best of all, it was an excessively rich and warm sound that the group proffered. Not a speck of their sonic palette was cold or icy. Of course, it helped immensely that all of the instruments at their disposal at that time were analog. Their appropriation of the ridiculously warm sound of the Mellotron only pushed them further in this direction. Most of the sounds of 1981 were chillier than what OMD were swimming in at the time. Thematically, this one was similar to the first two albums in that there was an eclectic mix of material that all fit into the band’s artistic point of view. They were reluctant at this point to write a conventional love song, but there was no shortage of passion on the album. Songs could be presentations of ironic distance [“Georgia”] but for the most part, these songs were straightforward to the point of transparency. Lyrics were trimmed to the bone in most cases with the fewest words with the greatest impact being the way forward. The unsung power here was in the music itself. OMD’s penchant for not having a verse/chorus/verse structure mean that most of their songs had the melody as a wordless chorus in their songs. It was an instantly identifiable stamp on their work and the point where this ceased to be was an indication that the wheels were coming off of the good ship OMD, but we are getting ahead of ourselves. 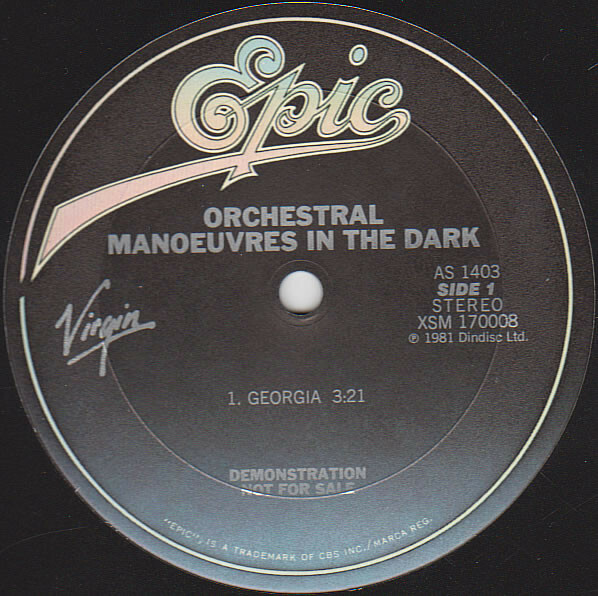 As 1981 turned into 1982, OMD were at their musical and commercial peak. How they reacted to this set of circumstances makes for a fascinating tale, as we’ll soon see. This entry was posted in Core Collection, Designed By Peter Saville, Rock GPA, Your Prog Roots Are Showing and tagged 1981, Architecture + Morality, Joan Of Arc, OMD. Bookmark the permalink. For me, Architecture & Morality is their masterpiece. A few years ago I was lucky enough to be a guest DJ on a local radio show here. (On occasion they let members of the public invade their space to play 10 songs for an hour.) I was part of their “new wave 80s” weekly show, and I decided to play early songs that I felt were pioneering and influential. The OMD track I played was “Joan of Arc (Maid of Orleans),” long plodding intro and all. MathManDan – It may be long-ish, but plodding? I’d never go there! Clearly I didn’t choose the right word, because I love the intro as well! Didn’t mean a negative connotation, although you could argue a non-radio-friendly connotation I suppose. It’s probably my favorite OMD track of all of them. It’s like having your ears syringed with hot rusty water then having a slap in the face with a glass brick. Gavin – But what color is the glass brick?! 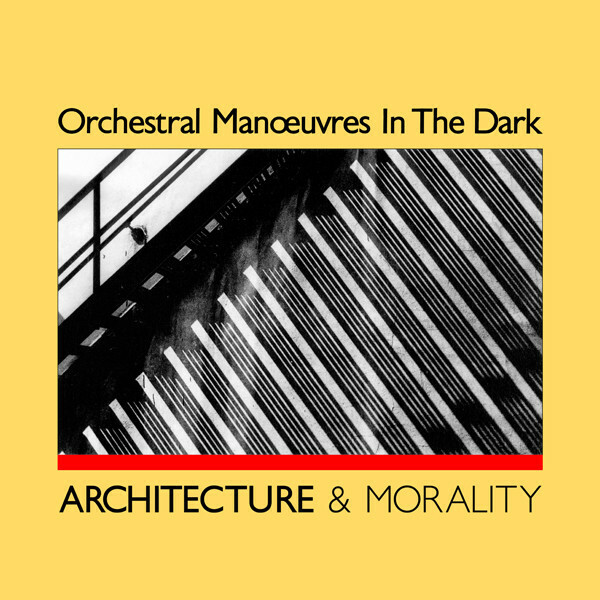 “Architecture & Morality” is the earliest OMD disc I possess, and it remains one of my all-time favorite albums. “Maid of Orleans” is truly stunning, a stellar example of what the late, great Lou Stathis once called “enoise.” It’s the band’s sonic masterpiece, comparable to such classic experimental electropop as Duran Duran’s “The Chauffeur,” John Foxx’s “The Garden,” Japan’s “Ghosts,” and Gary Numan’s “Slowcar to China.” All five songs have that “unusual yet emotional” quality, and each of them always breaks my heart a little even as I admire their musical majesty. What a quintet they make! James Pagan – All classics, but you forgot Bill Nelson’s “Empire Of The Senses,” Yes? That’s definitely another masterpiece–but I like “Another Day, Another Ray of Hope” even better for that “unusual yet emotional” quality. I revere the mystical Mr. Nelson!